Other categories I have include House Purchase, Refinance Records, Home Improvements, Maintenance Contracts, Warranties, and others specific to my needs. Some of these (like the purchase of my house) are documents I must keep but will never add anything to. When I bought this house, the previous owner handed me manuals for all the appliances, contact information for installers and service people she’d used, warranty information, and even extra light bulbs for some specialty fixtures. My paperwork is now organized enough that I could do the same if I ever sell the house (which I hope will be my heirs’ job, not mine!). Unless your file cabinet(s) don’t have rails (they should! ), make hanging box-bottom files for each category except Manuals (you’ll do those later). Make tabs for these files now – you can always change them, scrap them and/or add more later. Put these empty hanging files in your file cabinet drawer(s) alphabetically. 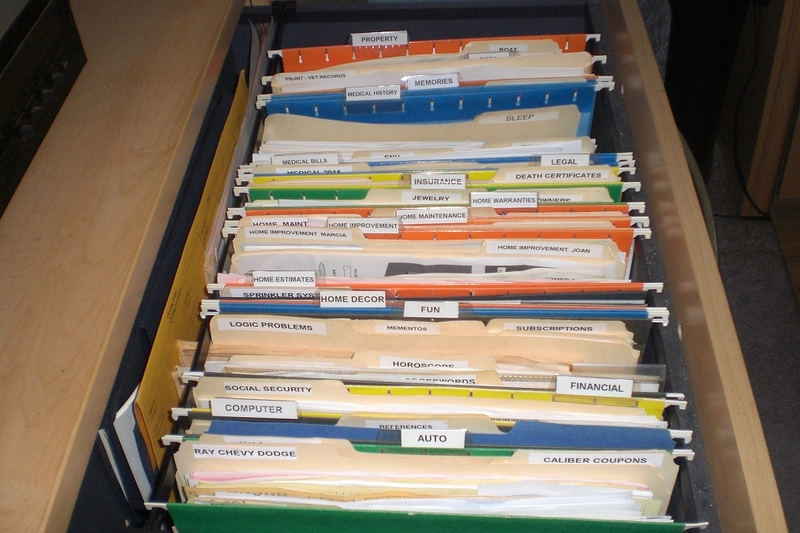 Otherwise, I suppose you could try using expanding file pockets wide enough to hold manila folders and still fit into your cabinet drawers (whether this is possible, I honestly don’t know). Check office supply stores to see if there’s something you can use to hold all the folders in a single category together and still fit into your cabinet drawers. Rails for hanging files, built in or added, are best.